Finally in the southernmost part of Laos, our final stop was the island of Don Det: one of the 4,000 Islands. One of the most laid back places I’ve ever been, we grabbed a little bungalow overlooking the river with hammocks on the porch and generator power from 6-10pm daily for about $2.50 per night. The touristic part of the island is really just one long street with tons of bungalows, restaurants and little shops that reminded me a lot of Hampi in India. 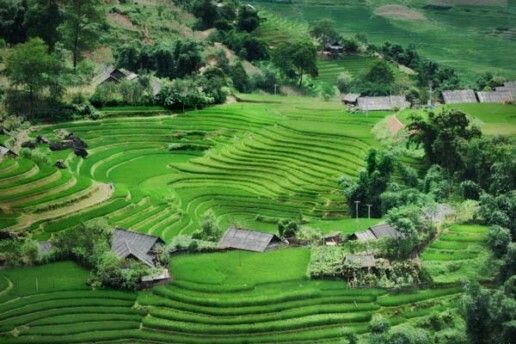 Beyond the touristic street are rows and rows of rice fields, paths to bike ride or walk on, local villages and nature everywhere. On our first night we went for a walk through the rice fields and watched as locals plowed the paddies with water buffalo-drawn plows while women picked rice in the distance. Later, a couple of workers invited us into their paddy to help plant some rice, an offer that we eagerly and graciously accepted. Some background on rice planting…first, the seeds are put into the ground and allowed to grow into what looks like a six-inch blade of grass. Next, these blades are picked from the root up, bunched together and taken to a rice paddy where workers wait to plant them into a shin-deep mix of mud and water. The planting process is simple. First, grab around five blades and hold them right side up with the palm of their hand facing outwards. Then, in one motion, thrust downward and put the bundle into the mud so that all five blades stand straight up and remain together. This is where we came in. After a brief demonstration, we were handed a bunch of blades of rice and began to plant. Leaning over with the setting sun on our backs, we laughed along with the local workers at our inability to get the quick motion down. Also funny was how our rice blades immediately fell in every direction after we plopped them in the mud. One quick look at the developing paddy revealed exactly which ones we planted and which they did. We continued to plant for another few minutes, but realized that we were probably giving them more work as I can’t imagine they didn’t have to redo everything we did. So, with hands together in front of the face, a bow of the head and a “cop jai lalai” (Lao for thank you very much) we took our leave and let them finish their day’s work. As for the rest of our two full days in Don Det, they can be very quickly summed up. One morning we braved the scorching 9am sun and, along with some new friends, rented bikes to ride to a nearby waterfall. Unlike many waterfalls on this trip, this one was massive and forceful. I can only imagine it during the height of monsoon season. Since the waters were way too rough to swim, we returned and sat in our hammocks all day watching the river flow by and the monsoon rains sweep through the town while flooding the streets. At one point I went for a bike ride through town during a downpour…very fun, though I came back covered in mud. The next day we literally just sat in our hammocks all day, read, relaxed and chatted with our bungalow neighbors. Then we left to head to Cambodia; sad that we had to leave paradise but excited to check out Angkor Wat.